What’s more fun than splashing around? Kids of all ages have a unique attraction to interacting with water for entertainment. Let California Waters bring out your inner kid with our engaging and delightful splash pads. There’s a world of wonder to discover in water. We love connecting people of all ages to the magic of water play – from toddlers to their grandparents. Creative, interactive splash pads bring out the curiosity and joy in everyone. 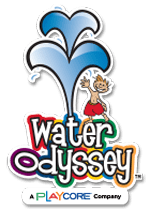 In fact, you’ll find our inventive, imaginative splash pads and spray parks in playgrounds, water parks, shopping malls, hotels, apartment communities, and RV parks – to name a few. Built as a stand-alone focal point or integrated into the surrounding environment, our splash pads incorporate an array of unique interactive features for cooling off and having fun, including enchanting tree showers, water cannons, rainbow arcs, misters, dumping buckets and more. Virtually any combination is possible, there’s no better way to delight a crowd. Margarita Park: Ali Bermanian, President, Pacific Play Systems Inc.